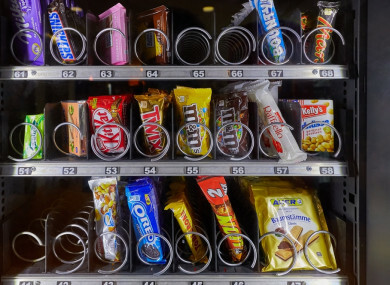 A GOVERNMENT REPORT published today has recommended that vending machines be banned from schools and that ‘No Fry Zones’ be implemented around schools and playgrounds in a bid to tackle childhood obesity. The Oireachtas Children’s Committee Report on Childhood Obesity has made a number of recommendations, including that new fast-food and takeaway outlets be banned from being built – or from operating – within 400m of the gates or site boundary of schools or playgrounds. A total of 20 recommendations to tackle the challenges of childhood obesity are laid out in the report, including a ban on vending machines in schools and stricter regulations on broadcast media around the advertising of junk-food. The report also recommends “targeted interventions” to tackle childhood obesity in lower-income households. One in four children in Ireland are overweight or obese, and these children are more likely to remain overweight or obese into adulthood, Chair of the Oireachtas Committee on Children and Youth Affairs, Fine Gael TD Alan Farrell has said. Farrell said today that the report’s recommendations must be implemented in full. The fact is that as many as one in four children are overweight or obese. These children are more likely to remain overweight or obese into adulthood. Email “Childhood obesity report calls for ban on vending machines in schools and 'No Fry Zones'”. Feedback on “Childhood obesity report calls for ban on vending machines in schools and 'No Fry Zones'”.